Second pregnancy : my labor story | escaped. Realized I've been procrastinating on this for quite a while now (compared to the first pregnancy). Shouldn't be that long, don't worry. There won't be 3 parts I promise, haha. "Still a long way to go. Lambat lagi baby nak keluar ni"
And my hope to deliver sooner went down the drain (just like it did during Rayyan's time). Prayed hard for the Braxton Hicks I've been feeling since a few weeks ago to at least dilate my cervix a feww centimetres, but no. She set us up for our next appointment on 23rd May, the due date. Nothing unusual. Went to Putrajaya for the husband's office barbeque party to send off his Japanese managers back to their country. Had fun. Nothing unusual. Spent some alone time at home while Rayyan was at his nursery, went to 7E to get some icecreams (had major cravings for them), had lunch, watched a little bit of Prison Break and The Big Bang Theory. At 4 am, I was woken up - by a sharp pain just below my belly. It comes and goes at a certain time frame - and felt reallllyyyy familiar. Took my phone and started timing the contractions. 10 minutes apart..5 minutes apart..
Woke Shahrul up and told him I was having contractions. "Is it real? 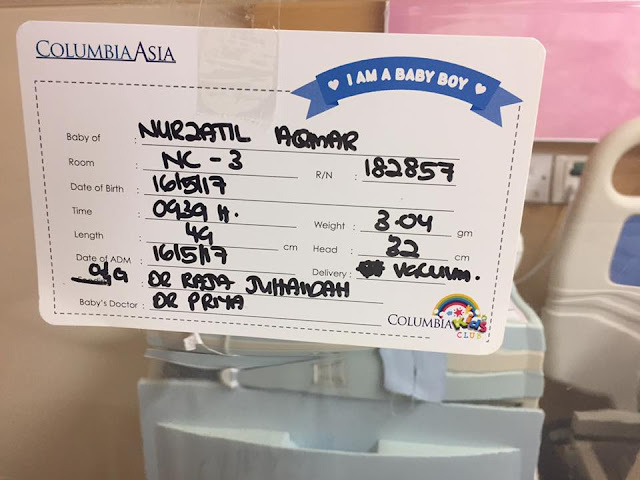 Nak kena pergi hospital dah?" So I told him to get showered and ready. At 5 am, I felt some tingly sensation down there, after a 1-minute intense contraction (most painful!) and touched my nightgown. It was my waterbag. My water just broke. "OK no time to get showered, just get ready to go to the hospital"
So in a flash, we got ready with my hospital bag, some food, and Rayyan's bag for the nursery. His teacher was willing to take him in at 6 am, which we were so thankful about. Sent him off and off we went to the hospital. Reached the emergency. Could barely walk by then, this time I felt the contractions were really painful FML T.T Why do people say it gets easier the second time?! Wheeled into the labor room and the nurses started prepping things (and me). I told them my water had broke. Then one of the nurses checked my cervix. "Baru 3 cm dilate. Sabar ye"
WHAT. The. My water broke, shouldn't it be at least 6 cm?! To be continued, Rafiy just woke up. Sorry will do part 2 soon! I feel the same. Gonna retire after 2 kids haha. Rafiy is such a sweet name :) tabarakallah Zatil!